the pink toque. a craft blog: More Huugs to Feature! 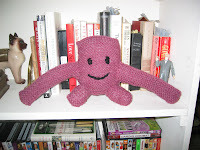 A few months ago I designed a free pattern for a knitted stuffed monster that I dubbed Huug the Hug Monster. Since then several people have made their own version, and I love featuring them! Sophia Dembling recently made a Huug of her own, which turned into a hilarious ordeal involving her Huug's face. I love it when I see the way others create something, because no two Huugs are ever the same! Sophia did a little experimentation on her Huug's face which turned into what she calls a disaster, but I call cute! Though I do have to agree with her -- the face and the Huug body separate were adorable. Together... well... not so much ;) This photo is copyright to Sophia and her permission was given to share the picture.